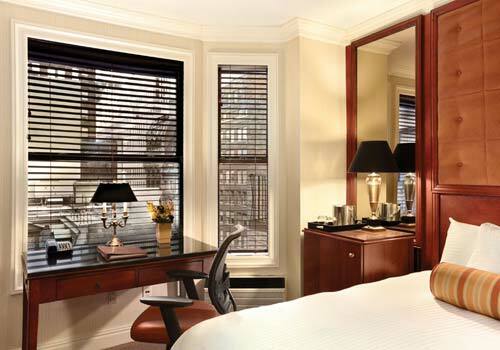 Situated in midtown Manhattan, The Iroquois New York hotel offers sophisticated accommodations inside a century-old, newly updated hotel. 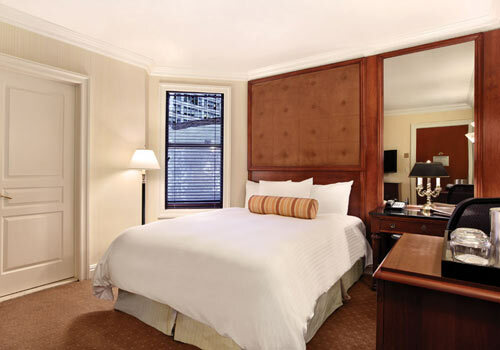 Guests can enjoy close proximity to top attractions like Times Square, Bryant Park, Grand Central and Rockefeller Center, as well as an on-site American restaurant, a cocktail salon, a 24-hour fitness center, in-room massages, a business center, and more. Ideally situated in Midtown Manhattan near Times Square and Grand Central Station, Iroquois New York melds classic design with contemporary amenities for a quintessential New York stay. 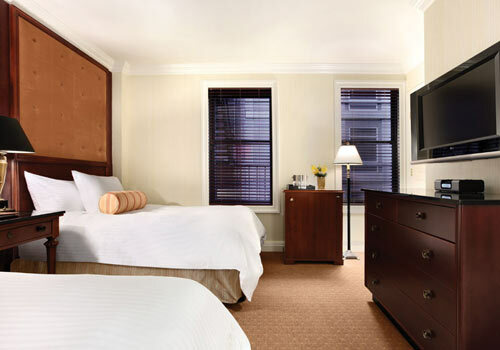 Built for both business and leisure travelers, our Midtown Manhattan hotel features 117 well-appointed guest rooms, including nine suites, with features such as Comfy Simmons Beautyrest mattresses, comfortable work stations and Jacuzzi tubs. 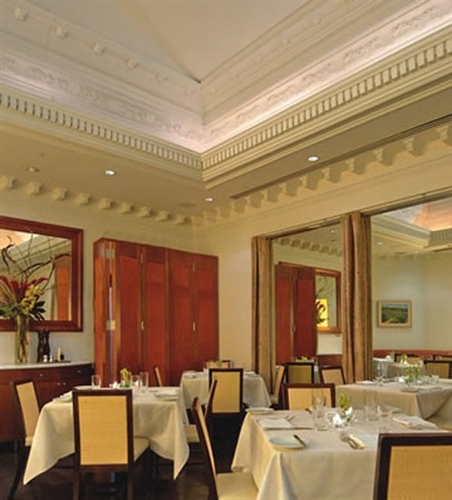 Other sensational features at this Small Luxury Hotels of the World member include onsite dining at Triomphe, cocktails at Lantern’s Keep, a knowledgeable concierge for recommendations, and a fully-outfitted 24-hour fitness center with Finnish sauna. 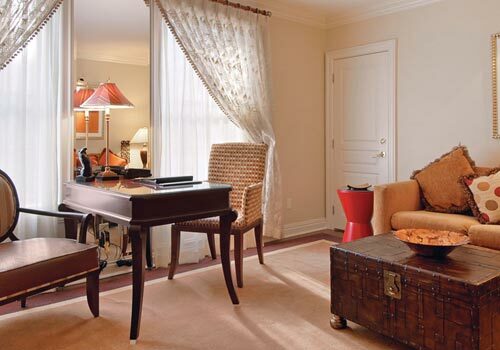 Check your email whenever you need to with complimentary wireless Internet, lounge with daily newspapers and complimentary coffee, and look your best with same day laundry service and complimentary shoeshine. 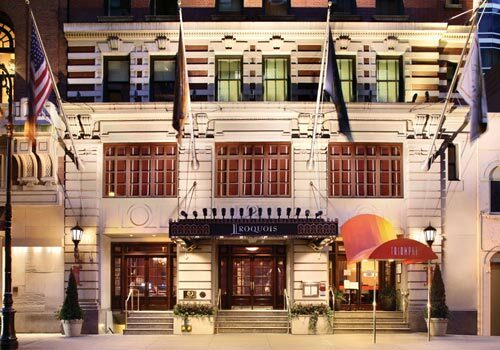 When seeking the best luxury hotel in New York City, consider Iroquois New York, the ideal destination for your most fulfilling New York experience. 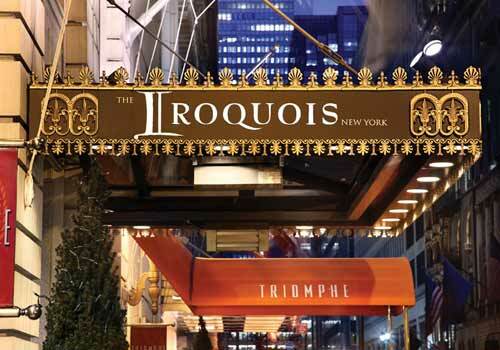 Have you been to The Iroquois New York? Share your knowledge and be the first to review this. 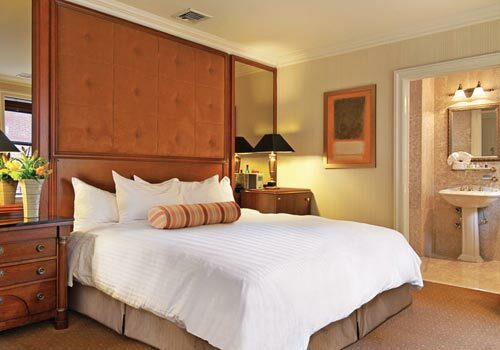 Definitely a great place to stay if you're in midtown! Clean and very courteous staff members. The room was a good size as was the bed. Stayed on the 3rd floor, but it was still quiet. Would stay again. "Beautiful hotel in the middle of the theater district." 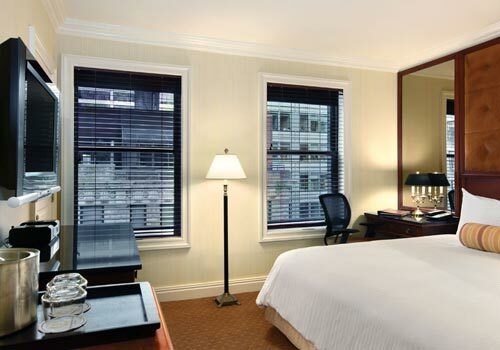 We booked this hotel at the last minute for an over nite stay in NYC. It is a beautiful, clean hotel with a friendly, helpful staff in the middle of the theater district. The front steps are a bit steep for people who have mobility issues, but there is a bannister to hold onto. That is the only negative thing about this hotel. Although the lobby, restaurant and bar are all currently under renovation, the hotel remains a great escape in the heart of Theatre district. Staff were all friendly and helpful. Will definitely be back! 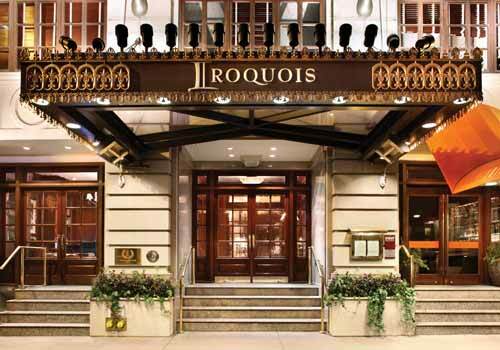 Wi-Fi access is complimentary for all guests at the Iroquois New York. Our 24-hour fitness center features free weights and cardio equipment. The fitness center also features a Finnish Sauna. 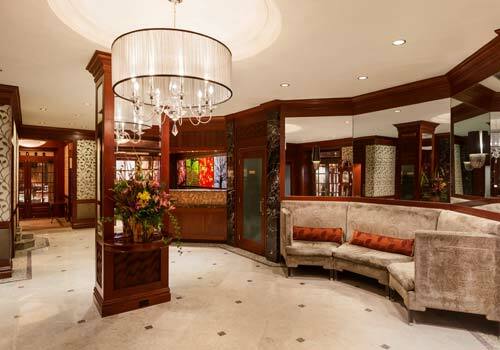 The Iroquois New York offers room service 24 hours per day. Yes. Our business center is located in the hotel lobby. Yes. Valet parking is available for a daily fee. Please inquire for latest prices. The rooms will not allow rollaway beds however cribs (pack and play) are allowed. There is no charge. Yes, the hotel requires a $75 deposit per night.